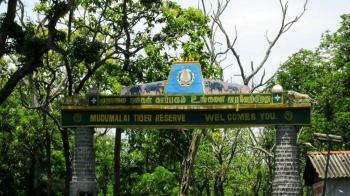 In April 2007, the state government of Tamil Nadu declare the Mudumalai National Park to be tiger reserved, under the section 38V of Wildlife Protection Act of 1972. Cost of Rs 4 crores was approved by the National Tiger Conservation Authority on Sep 16,2010 for continuance of project tiger for FY2010/11. Flora - Three types of forest are in the Sanctuary in the western Tropical Moist Deciduous Forest, in the middle Tropical Dry Deciduous Forest, in the east Southern Tropical Dry Thorn. Tropical Moist Deciduous Forest get the higher rainfall than the other forest. Two species of Bamboos are found in Mudumalai National Park, the giant clumping bamboos : Bambusa and Dendrocalamus Strictus. Fauna - About 50 species of Fishes, 21 species of Amphibians, 34 species of Reptiles, 227 species of Birds and 55 species of Mammals are the high diversity of animals present in the Mudumalai National Park. Thirteen percent of all mammal species in India are present in Mudumalai National Park. By Air - Nearest airport is the Coimbatore International Airport. By Rail - Nearest railway station is Udhagamandalam Railway Station. By Road - Mysore - Ooty highway is the nearest highway to the park and Gudalur is the nearest town situated along the highway.